What a difference a film’s length can make as we learn in director Peter Lepeniotis’s overlong (even at 86 minutes) feature length adaptation of his briskly paced 2005 roughly 10 minute animated short Surly Squirrel. 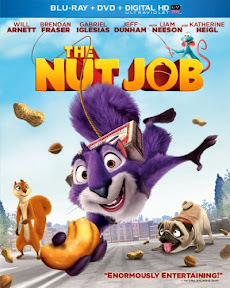 In The Nut Job Lepeniotis transfers the same unique premise which finds the aptly named, quick-thinking yet self-serving and quick to con squirrel Surly (Will Arnett) in the midst of a real live human bank robbery while planning the perfect heist in his eternal quest for food. Whereas the short film kept its sights small, the feature length Universal Picture borrows the oft-utilized caper set-up derived from the classic Italian comedy Big Deal on Madonna Street (that’s been repurposed in dozens of pictures since) as Surly plots to steal the inventory of a nut store without realizing that the shop is a cover for crooks trying to tunnel into the nearby bank. 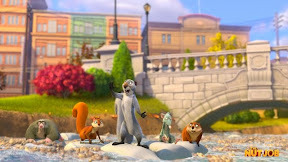 Simultaneously casing the job while also recruiting new allies to his side such as the crooks’ tough-looking but softhearted Pit bull (voiced by Maya Rudolph) Arnett’s Surly even finds himself working alongside his old forest friends who’d banished him from the park after being burned one too many times by the selfish squirrel. Desperate for food to feed the entire park, Katherine Heigl’s brainy Andie is cautious about her new partnership from the start but finds her alliance tested even more when Surly and his sources discover that the real reason the park is having a food shortage is due to a furry friend that Andie’s trusted her entire life. 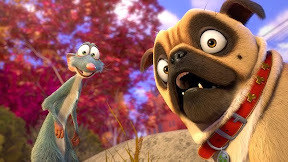 While there are some dynamic action sequences that are brought vividly to life in the warm-toned visually stunning CG animation from former Toy Story 2 animator turned director Lepeniotis (including an inventive opener and an interesting chase that uses birds as parachutes), compared to the overwhelming dull stretches, the diversions are few and far between. Bogged down by a hero you can’t really root for until he inevitably and rather abruptly sees the error of his ways by the end, you can’t help but wonder how much better the film would’ve been if say, Andie had been bumped to the lead role and Surly had been turned into a supporting player. 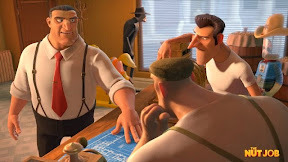 For while Surly was ideal in a 10 minute classic Looney Tunes inspired production, he isn’t the best main character to build an entire plotline around. 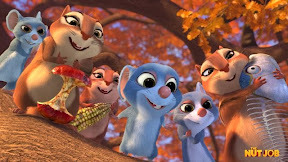 However, to be fair, Nut’s pretty unbalanced in the way it seasons its cast of characters as far too often the film relies on bodily function sidekick humor for cheap laughs rather than serving up solid roles. One bright light in this lackluster Job is unexpected MVP Brendan Fraser’s spirited vocal performance as a dimwitted wannabe hero Grayson whose knack for failing his missions is nearly equal to the size of his own ego. 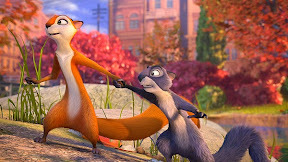 Completely wasting the talented Arnett on a character who loses his spunky personality in favor of a redemptive formulaic paradigm that rings false by coming completely out of left field (as never once were we led to believe earlier on that Surly even wanted to change), The Nut Job is a missed opportunity on a number of levels. All in all, it’s a vital reminder that there is still a worthwhile market for high caliber short films as perhaps Surly would’ve entertained us better as part of an anthology film that introduced us to all the characters in a series of shorts that were each as unique and inventive as the filmmaker’s 2005 introduction to the squirrel. While younger children may be more forgiving than older ones despite lulls that may make them restless in the film’s running time that feels nearly double its length, hopefully by stepping back to watch this full-bodied roast side-by-side with the shorter serving, the filmmakers will be able to reevaluate exactly where they went right and wrong while whipping up this batch for the big screen. Though admittedly blandly appetizing, here’s to hoping that the next Nut they make will follow a less familiar recipe in order to deliver something to the audience that’s not only much more flavorful but filled with greater opportunities for its talented cast to crack us up in Universal's upcoming sequel to this forgettable first Job.